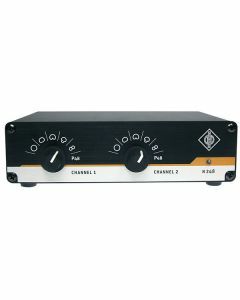 The Neumann N 248 Power Supply provides 48 V phantom power to the Neumann Microphone range. Able to supply either two mono or one stereo microphone, the N 248 can also be used with the Neumann TLM 170 R to control its directional patterns remotely. The N 248 supplies one stereo microphone, or two mono condenser microphones with 48 V phantom power (P48). All connectors are of XLR 3 type. The audio signal outputs are DC-free. The 5 directional patterns of the TLM 170 R can be remote controlled with rotary switches. The remote control operates by varying the nominal phantom voltage of 48 V over a range of ± 3 V (patented). As in standard operation, cable lengths up to 300 m are permissible. Set to P48, all conventional microphones can be used as well. Even mixed operation is possible, with one channel remote controlling a TLM 170 R, while the second output supplies a conventional microphone.